September « 2016 « Kashiwa Dojo: 7 Days of Training in the Netherlands – Phew! 7 Days of Training in the Netherlands – Phew! Kashiwa dojo had a great 5 days in Amsterdam at the Netherlands Kendo Association 50th anniversary summer seminar. Congratulations to students Isa Carbone, who passed ikkyu in both jodo and iaido, and Abdul Oyede who passed ikkyu iaido. 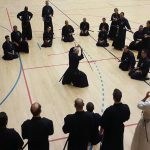 In both the iaido and jodo seminars we whizzed through seitei and then focussed on koryu: Jodo omote and chudan with Ishido Sensei, Otake Sensei, Shoji Sensei, Yoshimura Sensei, Rene Sensei and European nanadan sensei. Was great having the opportunity to compare Fukuoka and Tokyo styles thanks to Otake and Shoji Sensei’s many embu. Then Shinkage ryu iaido with Matsuoka Sensei and Kinomoto Sensei; Lots of bokuto training! Then on to Utrecht for two more days with Matsuoka and Kinomoto Sensei for the Himawari seminar: One day of seitei iai and then another day of shinkage ryu. Absolutely wonderful! Huge thanks to all the teachers for working, and working us, so hard; the organisers for doing such a great job, Andy Watson (Ryoshinkan Dojo) for tireless English/Japanese translation and of course the Shinkage Ryu Family Europe for making us feel so welcome. From left to right: Abdul Oyede, Isa Carbone, Kinomoto Sensei, Matsuoka Sensei, Will Heal. Watching Matsuoka Sensei demonstrate (Photo credit Elise Heijboer). 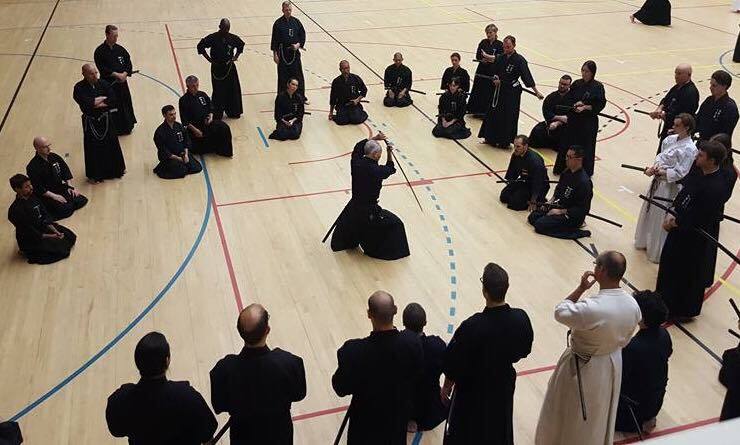 Posted in Events, Iaido, Jodo, Shinkage Ryu | Comments Off on 7 Days of Training in the Netherlands – Phew!